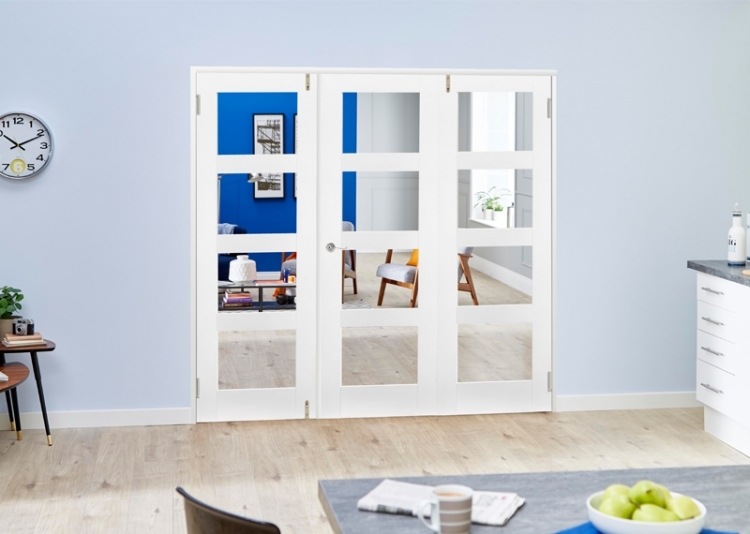 This clear glazed, white primed shaker 4-lite frenchfold door set will let light filter through your home and allow you to open up your living space when you’d like a taste of open plan living. Their Frenchfold design provides the benefits of the central opening of a traditional internal French door along with the option to open up space completely, usually associated with an internal bifold door. Available in 3 and 4 door systems in a variety of sizes, you’re sure to find just the right fit for your home. Installation is simple, although we’d recommend a joiner does the job. This set comes with universal frame set, pivots, hinges, brushed stainless steel drop bolts and pre-glazed doors…all you need is a handle and latch! Popular 4-lite shaker style design.